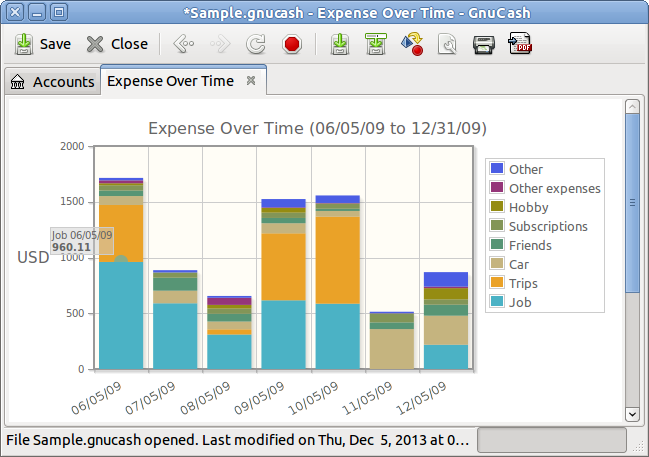 This tour will introduce you to new major features in GnuCash 2.6. A barchart rendered in GnuCash with jqplot. 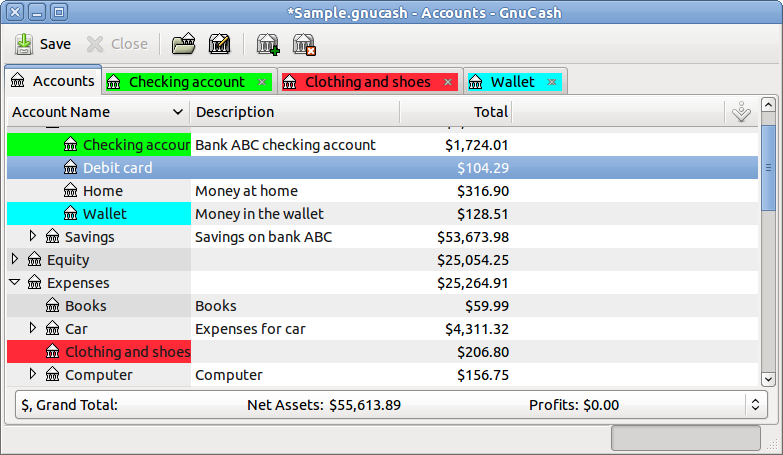 The old GnuCash custom report management system has been revised. You can save a report using the dedicated options in the File menu and rerun it later by selecting it from the menu Reports->Preconfigured Reports. 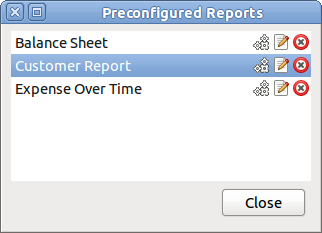 The Preconfigured Reports window. You can select and run a preconfigured report, edit its name and delete it. 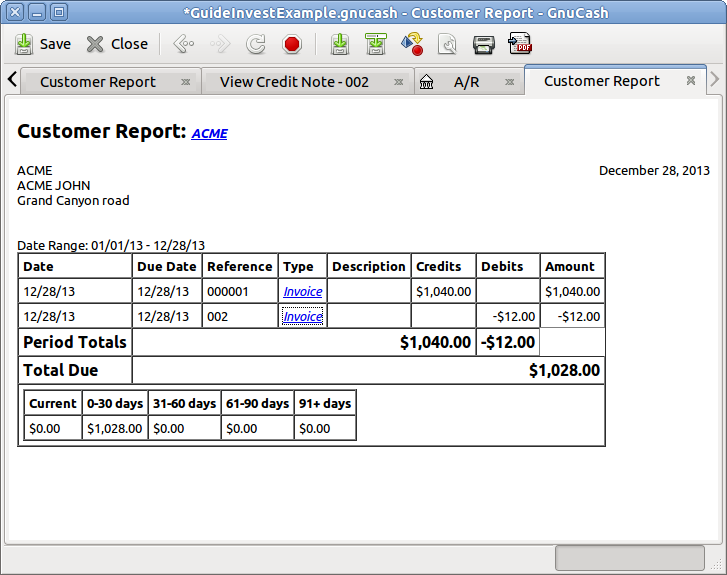 Reports and invoices can be exported directly in a PDF file without going thru the Print window. It is now possible to link an external file or a location (URL) to a transaction. This long-requested feature is available through both the Transaction menu and the transaction's context menu. The files are displayed in the default viewer for that file type. You can now attach a file or a location to any transaction. It is now possible to associate to any account a unique color from the edit account window. This color can then be displayed as account name and account register tab background easing the lookup of a specific account. The colors ease the lookup of specific accounts in the account tree and in tabs. Timout on "Save changes on closing"
In the General tab of the GnuCash Preferences is now possible to set a timeout for the "Save changes on closing" window. If enabled, the "Save changes on closing" question will only wait a limited number of seconds for an answer. If the user didn't answer within that time, the changes will be saved automatically and the question window closed. When opening a locked "book" one now has the option of opening it read-only. Note that GnuCash is still a single-user program and that the database backends are still used only as a data store. The new button to open a GnuCash datafile in read-only mode. It is now possible to save the "Filter By..." settings for an account register. 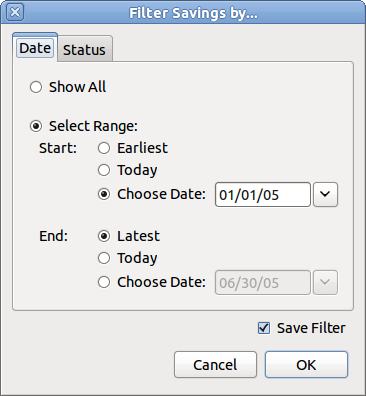 Save the "Filter By..." settings by enabling the "Save Filter" checkbox. Customer report with an invoice and a credit note. 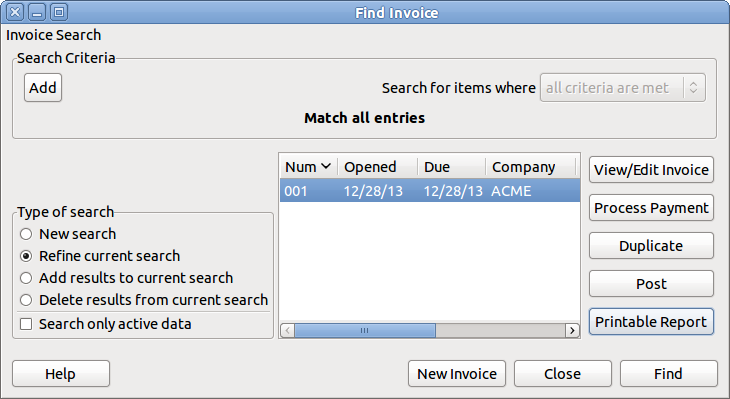 Updated search window with buttons to process payment, duplicate, post and print multiple search results. The preferences system has been rewritten to use GSettings from GIO (GLib) instead of GConf. This is a simpler and more robust backend which writes to the OS's native prefs - defaults on OS X and the Registry on MSWindows - and allows us to remove several troublesome dependencies including GConf, ORBit, and DBus. Note that window position, column sizes, and sort orders will not be migrated from GConf. Those settings will revert to the default the first time you use Gnucash 2.6 or later, but they will be saved once you've reset them. By agreement of all authors we have relicensed GnuCash to the GNU General Public License Version 2 or later from just Version 2. You can download the new 2.6 version of GnuCash from the GnuCash website main page. GnuCash 2.6 comes with updated Help and Guide. If you can't find the answer to your questions in those documents, try with the GnuCash wiki. If both options are unsatisfactory, you can send your questions to the GnuCash mailing lists: the GnuCash community is very friendly and experienced and someone will surely assist you.